Your enquiry has been sent to Christopher Kirby and they will be in touch directly within the next few days. I utilise all the components of fitness to create well-balanced, fun and effective training programmes for my clients. BSc (hons) Sports Therapy. Whether you want to lose weight, tone up, build muscle or recover from injury - my approach remains consistent and effective - goal specific, individually tailored exercise programmes, which will help you to smash your targets. As a graduate sport therapist (think physiotherapy mixed with sports science), I like to take a holistic approach to fitness by incorporating strength training, cardio, functional movements and mobility exercises. This helps my clients to achieve their goals, whilst also giving them health benefits that will carry over into other aspects of their lives. Sore neck or back? poor posture? lack flexibility? I have the qualifications, skills and experience to help! I've held various different positions during my 10 years within the health and fitness industry. 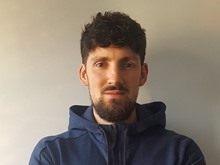 After graduating with a BSc (hons) Sports Therapy in 2010, I went on to work as the first team sports therapist for different semi-pro football clubs in south London. Here I was responsible for the injury management of first team players, as well as running their strength and conditioning programmes. I also worked as rehabilitation case manager for three years, specialising in neck and lower back care, which gave me valuable experience dealing with the back & joint problems most people experience in their lifetime. In addition to this, I've been working on a 1-1 basis with clients since gaining my qualification, helping them to reach their fitness goals. It's the area where my true passion lies, so I decided to set up CK Sports Therapy in 2016. Since then I've been providing a mobile personal training and sports injury service to a lot of satisfied customers in south London. With a van load of equipment, I bring the gym to you! Whether its at your home, local park or work. First 10 sessions for £275!!! !